Recently, along with several other members of the media, Busted Wallet’s editorial staff was invited to spend some quality time at Shanty Creek Resorts which during the winter months serves as a full service ski resort. Throughout our time at the resort we toured the property, took advantage of the slopes and enjoyed the beautiful sights of Winter in northern Michigan. Our stay was designed to showcase everything that the resort has to offer during the winter months including skiing, tubing, snowshoeing and fine dining. The folks at Shanty Creek also made a point to share with us some major renovations and upgrades that were made for 2015. If you’ve stayed or skied at Shanty Creek in the past you’ll now notice some new and exciting changes. For starters, their Ski School and a majority of their rental equipment has been moved from Schuss Village to Cedar River Village. Another change at Cedar River is the upgrades made at the Lodge at Cedar River. On the main floor there’s a brand new full service bar and restaurant, with seating for up to 120 and views of the Cedar River golf course. They’ve also moved the alpine tubing hill over to Summit Mountain to make room for the new location of the resort’s Ski School. These changes were put into place to upgrade the entire resort experience and after spending the week enjoying them we have to say that they pulled off the changes quite nicely! Made up of three villages, Shanty Creek Resorts offers three different and unique lodging options. Whether you’re visiting the resort for business or for a long weekend away with the whole family – you’ll find a comfortable and convenient place to lay your head after a long day taking in everything the resort has to offer. Sitting on top of Summit Mountain and overlooking beautiful Lake Bellaire, The Lakeview Hotel easily has the best views of the whole resort and serves as the flagship property of the resort. As you walk through the main entrance and up to registration your eyes automatically gaze up at the soaring ceilings with gorgeous exposed wooden beams. From there you can’t help but walk towards the amazing view the property offers via the wall of windows looking over Summit Mountain and Lake Bellaire. An entrance like that gets you excited to see what else the resort has to offer. In 2007, Lakeview Hotel + Conference Center underwent a multimillion dollar renovation and it still shines bright as if it was done this year and not 7 years ago. Lakeview houses 183 rooms that range from a traditional hotel room with two queen beds and a refrigerator to a deluxe spa parlor room that features a full kitchen, fireplace and a jacuzzi. This all-in-one property features The Lakeview Restaurant, The Spa, Arnie’s Grill, and indoor & outdoor pools. Since the Lakeview is perched on top of Summit, it offers ski-in/out access to the 11 runs on the hill as well the newly relocated Alpine Tubing Park. Once you’ve warmed up on Summit, you can catch the ultra convenient (and free!) resort shuttle to Schuss Mountain. In the warmer months, two of the resort’s golf courses – The Legend & Summit GC – are right out your backdoor. For groups, the Lakeview Conference Center has over 16,000 square feet of meeting space that has a variety of rooms and configurations to please any meeting planner or bride-to-be. If you are getting the whole crew together, Summit Village also offers privately owned condos and homes that you can easily reserve through Shanty Creek’s website. They are all within walking distance of Lakeview Hotel + Conference Center, all of its amenities and the resort shuttle stop. As you drive up to the lodge and it comes into view, you feel like you are entering a charming European village at the base of the Alps. Located at the foot of Schuss Mountain, the Mountain Lodge is where the action is at. Here you’ll find a variety of lodging options including condos and villas all within walking distance of the main lifts of the mountain. The connected heated outdoor pool is open all year long, meaning in the winter months, it’s basically an oversized hot tub. It’s an excellent way to relax your calves after a long day shredding the slopes. Ivan’s Café is located right next door where you can grab a beer, a bite to eat at the cafe, or live entertainment. Want to discover the rest of the resort or head over to ski Summit Mountain? Jump on the shuttle! The Lodge at Cedar River is located in the resort’s newest village – Cedar River. Built in 1999, the property offers 72 suites plus 14 two, three, & four bedroom condos that are slopeside in the winter and golfside in the summer. This property’s location is what one thinks of when lodging is referred to as ski in/out. Right out the back door, just step into your skis or board and head down the slope to the Purple lift that will take you to the top of Schuss Mountain. Ready for a break or to be done for the day? Head down the North Face of Schuss towards The Lodge and ski right across the bridge to the back door of the property. If you’re new to skiing or boarding, Shanty Creek’s Ski School and Rentals now make their home in Cedar River. They even have a handy shuttle that will bring you from the backdoor of The Lodge to the beginner ski area across the street so you don’t have to carry all your gear. The property’s restaurant, The River Bistro, serves up breakfast, lunch, dinner and has a full bar. The Lodge is also home to a game room, meeting rooms, pro shop, and a heated outdoor pool area. Heated outdoor pools in the wintertime are a magical thing. Again,if you want want to explore the rest of the resort – hitch a ride on the free resort Shuttle. Bonus: There’s a TV channel that plays nothing but classic Warren Miller ski movies at all of resort overnight rooms. Tucked away in northern Michigan’s snow-belt, Shanty Creek Resorts is a skiing and snowboarding paradise. Comprised of two ski slopes, Schuss Mountain & Summit Mountain, Shanty Creek provides options for skiers of all levels. At Schuss you find a 450′ vertical drop, 41 runs, and 6 chair lifts. Of the two slopes, Schuss Mountain is our favorite by far. The setup is pretty expansive for a Michigan resort and was created with a thoughtful layout. Skiers of all levels can start at the top together yet take runs that fit their skill-set and still be able to meet up at the bottom of same lift to take the ride back up together. Pro Tip: If you ever lose you ski buddy or group take the lift you’re at to the top. At Schuss, 5 out of 6 lifts take you to the peak. The red lift is the only one that won’t get you there. A few other great features Shanty Creek offers is quick turn-around ski and snowboard rentals at the Lodge at Cedar River, as well as ski school for beginners. At Schuss Village, the new Day Lodge offers picnic style dining area at the foot of the east face. The Day Lodge at Schuss is where families and groups can pack a lunch, set up ‘camp’, and spend the entire day. Here you can also buy your lift tickets and rent lockers. With lift tickets ranging from $40 to $70 ea. it’s nice to know there’s an option at the resort for families and groups on a budget when it comes to feeding the crew for the day. Schuss also offers terrain parks with rails, features and some pretty epic jumps as well as wooded areas for carving through the trees. If you’re into racing and feel the need for speed, each weekend Schuss runs NASTAR from 1-3pm. Insider Tip: If you’re feeling a little chilly and want to warm up, but don’t don’t want to trek back to the Day Lodge or hotel room – hop on the Purple lift and about half way up look to your left… there you’ll see a stoked bonfire surrounded by like-minded and similarly frigid skiers. As for Summit Mountain (located 3.9 miles from Schuss) we discovered a more compact setup offering up 340′ of vertical, 11 runs and 2 chairs. The runs here are obviously shorter and the layout is more tight, but we still enjoyed the slopes. If you stay at the Lakeview Hotel you’re perched atop Summit Mountain and the views are amazing. When booking a trip to Shanty Creek we’d suggest spending the majority of your time at Schuss for skiing, but don’t pass up Summit. It is charming and has some interesting runs. The chair lifts on the other hand… they’re a little tricky so prepare for some steep unloading. All-in-all the skiing and snowboarding experience that Shanty Creek provides is one of the best we’ve experienced in the state of Michigan. If you’re planning a ski trip and aren’t sure where to go be sure put Shanty Creek on your short list. You’ll soon find it to be one of your favorites too. Though Shanty Creek’s most popular winter activity is downhill skiing and boarding, they are not the only options available to those looking to take in the snow covered outdoors. SCR has a full lineup of winter fun that includes something for everyone in your group. Cross country skiing is an excellent way to enjoy the beauty of a Michigan winter. SCR has 30 kilometers of groomed and track set trails. If you have your own equipment, cross country trail heads can be found at all three of the SCR villages. Don’t have your own equipment or a clue how to cross country ski? No worries! The Nordic Center at Cedar River Village offers rentals and lessons. This year, Alpine Tubing has a new home at Shanty Creek – atop Summit Mountain at Summit Village. Previously found at Cedar River, the move of Alpine Tubing to Summit Village made room for the resort’s new and improved Ski School at Cedar River and we’re on board with the change. We’re also on board with how fun tubing is at any age! The Alpine Tubing area has 5 tubing lanes and believe us when we say the hill is higher and faster that it looks. Depending on the conditions of the hill, single riders or groups of up to 4 tubers can fly down the hill together. For those speed demons out there, choose lane #1, it’s always the fastest! Once at the bottom of the hill, just grab your tube and step onto the Magic Carpet to effortlessly make your way back up the hill. Want a break from the fun or just feel like being an onlooker? We found an awesome (and warm!) fire pit area overlooking the tubing area complete with tables and chairs. Alpine Tubing is available Friday – Sunday as well as Holidays and tickets start at $12 for an hour pass. If you’re looking for a different way to see the winter wonderland surrounding the resort, snowshoeing is an activity for every ability level while still being a nice workout. The new multi-purpose Nordic trail at Cedar River will bring you around the snow covered Cedar River Golf Course. Snowshoeing passes and rentals are available at the Nordic Center at Cedar River Village. This activity caught our attention right away since it’s something that every kid (and adult!) has wanted to try. While the resort’s Dogsled Rides are designed for children under 100lbs, you’ll most likely run into Pets That Pull’s adorable crew of Siberian Huskies around the resort since they follow their owner Mike King everywhere. During our time at the resort, we ran into members of the team relaxing at Cedar River and at the base of Schuss Mountain between and after sled rides. Dogsled Rides are $15 each and last approximately 12 minutes. Who hasn’t wanted to go ‘dashing through the snow in a one horse open sleigh’? Well you’re in luck and on Saturdays and Holidays at SCR, you can sing ‘Jingle Bells’ while actually living the verse in the classic holiday song – all winter long. Sleigh Rides are only $12 per person and children under 3 are free when accompanied by a paying adult. Rides run every 45 minutes and last around 25 minutes. Shanty Creek Resort is located near the Jordan Valley Trail System which means you can add another outdoor activity to your list while staying at the resort. SCR has partnered with Blue Sky Rentals who will deliver one- and two-person snowmobiles right to you. Reservations must be made in advance. Whew! After participating in all of the resort’s activities, you’re going to be in need of some deep relaxation. We know we were! Shanty Creek’s Spa is located at The Lakeview Hotel & Conference Center at Summit Village and offers a variety of treatments and packages from massages, body scrubs, wraps, and more. Needless to say, there is always something going on at Shanty Creek Resorts. On top of all of their traditional winter activities, SCR hosts weekly activities including kids activities, movie nights, live entertainment, and more. You can find their weekly events calendar, ‘Creek Speak’ on their website as well as at each lodging property at the resort. Shanty Creek also has a long list of seasonal events each winter that will make you start planning your next trip back including The Slush Cup, Cardboard Classic, Beer+Boards, and the Schuss Mountain Snow Challenge. Bonus: Gandy The Purple Goose! This season is the triumphant return of SCR’s beloved mascot – Gandy! After about a 15 year hiatus, Gandy is back better than ever and you don’t have to be a kid to be pumped about it. On Saturdays and holidays you can find Gandy skiing down the hill at Schuss or the beginner ski area or even tubing over at Summit Village. Just imagine a 7+ foot tall purple goose hitting the slopes and believe us that it’s a thrill in itself to run into Gandy when you least expect it. We caught up with Gandy at the Alpine Tubing area at Summit and we all took a ride – giant purple goose and all – down the hill. It was one of our favorite moments of our stay at SCR. That Gandy is fearless! Whatever activities you take part in or where you stay while visiting Shanty Creek, you are never far from a bite to eat, a cold beer, fine dining, or even a Shot-Ski. The Lakeview Restaurant is located at Summit Village inside of the Lakeview Hotel + Conference Center overlooking Lake Bellaire. The restaurant is part of the hotel’s large, open Great Room and almost every seat in the house has a window or is not far from a roaring fireplace. The Lakeview serves breakfast, lunch, and dinner and offers a regional, eclectic menu. Menu items include beautiful breakfast frittatas, fish tacos, fried risotto, pulled duck quesadillas, pork rapoza, and sauteed salmon. Arnie’s Grill is the restaurant’s bar area where you can sip a cocktail in between runs on the slopes or grab a sandwich to refuel. Executive Chef Andrew Reh was named Michigan’s Culinary Star of the Year by the Michigan Lodging and Tourism Association and the dishes served up reflects why he is very deserving of this award. While visiting the resort, you should plan to have at least one meal at The Lakeview Restaurant during your trip. Located inside The Lodge at Cedar River, The River Bistro offers a sports pub type setting and serves breakfast, lunch, dinner, and a full bar. Overlooking the north face of Schuss Mountain, it’s a great place to start your day on the slopes by filling up at their morning breakfast buffet filled with all the fixings including made to order omelets and freshly made waffles. The lunch and dinner menu offer something for everything including salads, appetizers, sandwiches, burgers, entrees, and pizzas. Some of the menu favorites are the toasted raviolis, bourbon barrel smoked salmon spread, short rib sandwich, truffle fries, and pan-fried perch. 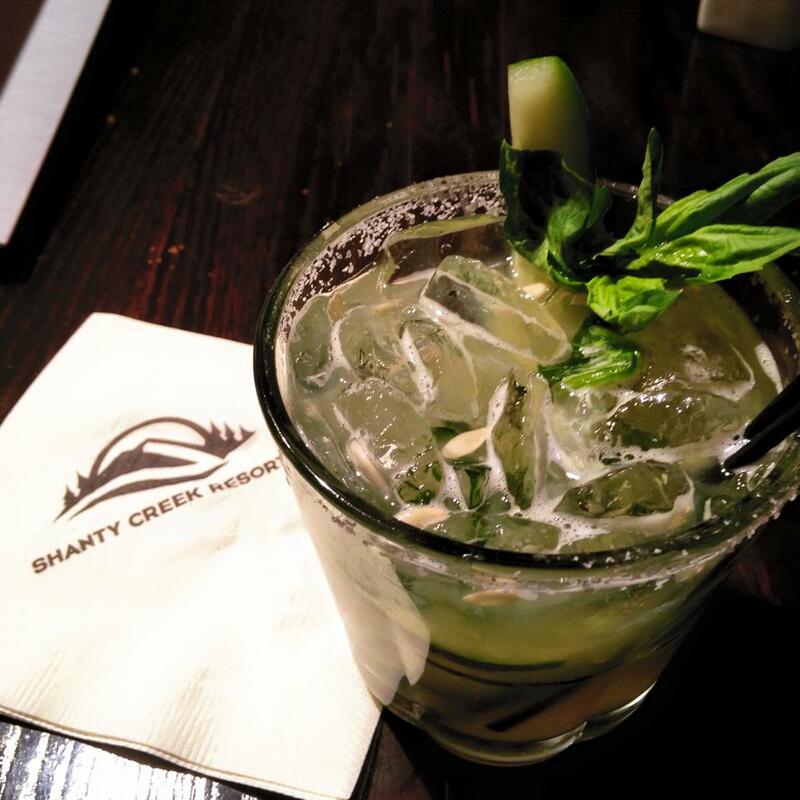 Along with a full bar, The River Bistro offers fresh fruit mixed cocktails and spirits including the Angry Bellini, Dirty Banana, and our personal favorite – the Cucumber Basil Margarita. You can also unwind between sessions on the slopes or at the end of the day here by shooting some pool or playing a few rounds of shuffleboard. The big screen TVs allow you to catch up on the big game. Best of all, since The Lodge at Cedar River is ski in/out, so is The River Bistro. Needless to say we spent a good amount of time between runs here during our stay at the resort. Ivan’s is perfectly placed at the base of Schuss Mountain and is a great spot to meet up with the group for a drink or a bite to eat before, after, or in between runs on the mountain. New this year, Ivan’s has transformed into a premier skier’s cafeteria with quick serve options like ready made salads, sandwiches, soups, chili, french fries, pizza, and Starbucks Coffee. Be sure to locate the magical menu item called ‘Ivan’s Pickles’. This changeup means no more waiting forever on a busy Saturday for a bite to eat when you are starving RIGHT NOW and want to get back on the hill RIGHT NOW. Also it means the speed of service is much quicker and the wait for tables is much shorter. Even though the food service has changed up a bit, Ivan’s still serves up cocktails, craft beer, wine, and offers “The Largest TV in Antrim County”. Unique to Shanty Creek’s bar menu is their partnership with Bellaire’s very own Short’s Brewing Company. Short’s has created two specialty made brews that you can only get at the resort including Black Diamond and Shanty Buzz. You can’t even get these 10 minutes down the road at Short’s own brewery. Black Diamond is a dark American lager that was originally made to celebrate SCR’s 50th Anniversary. While its deep, black color make it look like an ultra heavy beer, it’s actually a light bodied lager. We were fans after the first sip. Shanty Buzz is a light, clean, easy drinking Hefeweizen with flavors of bananas and cloves. Again, we were fans after the first sip. We fully approve and support this Shanty/Short’s partnership! If you’re looking for something to do after the slopes close for the night we highly recommend checking into one of the many bars or restaurants on-property. A hot spot to check out (even in the day) is Ivan’s Café. Ivan’s was formerly a full service sit-down bar and grill. Today Ivan’s is still a bar, but they’ve switched over to cafeteria style dining, which is nice for a quick bite to eat. On the weekends you can catch dueling pianos, listen to live music and even swim in the outdoor heated pool over looking Schuss Mountain. Another fun spot to check out is “The Shanty,” right next to The Lakeview Hotel and Conference Center, is a great hole-in-the-wall bar that serves everything… and by everything we mean beer, wine and liquor. If you’re feeling a little adventurous and want to go off-property. We highly recommend hitting up Short’s Brewing in Bellaire, MI. It’s about 10 minutes away from the resort, the Shanty Creek shuttle will bring you there and they serve fantastic brews and food. Our favorite brews on tap = Soft Parade & Cone Thugs. Pro Tip: The SCR Shuttle runs till 11:00 pm nightly. When the shuttle stops running for the night you can use the new SCR taxi service, which will take you just about anywhere for $2.00 per person each way! While staying at Shanty Creek Resorts one thing always remained consistent – the excellent level of service and energy the staff showed towards guests. During our stay we had the unique opportunity to see the staff interact with guests on slower weekdays as well as on a busy holiday weekend. While there were hundreds upon hundreds of more guests on the weekend, packed dining rooms and busy ski slopes the staff kept their cool and were always kind, helpful and had a smile on their face. It’s always nice to be somewhere you can tell the staff is genuinely happy to be there. Beyond their patience and incredible energy, we found the Shanty Creek staff to be extremely personable and knowledgeable about the resort. Some of the best advice and tips came from our friends tending bar at Ivan’s. 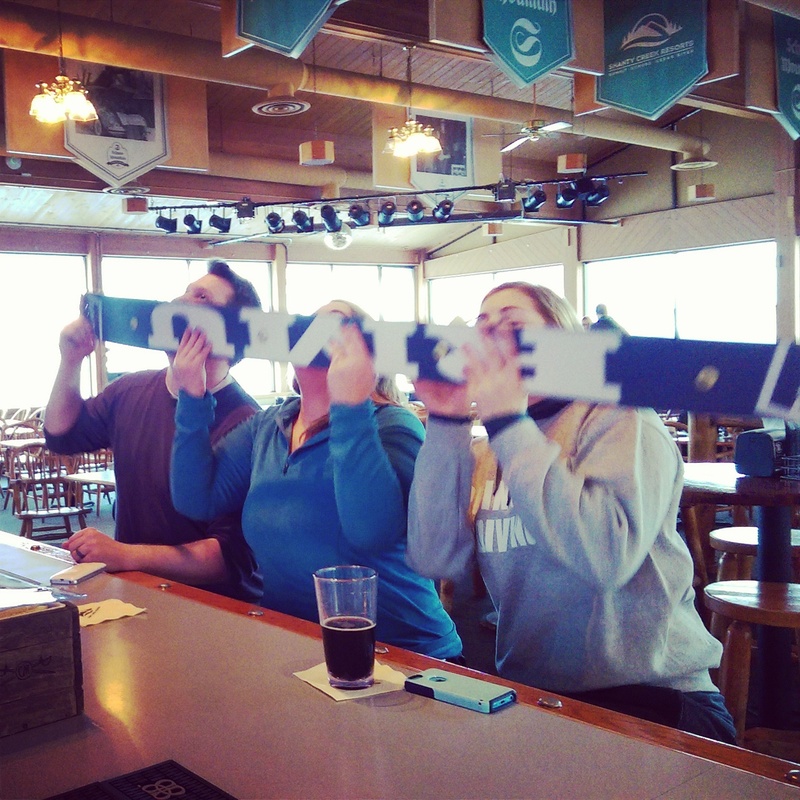 They have a shot-ski behind the bar (so we knew we could trust them) and were able to share a lot of good information about the resort including upcoming events and local hot spots. Shanty Creek Resorts is a wonderful winter getaway. Harnessing all that's good about northern Michigan snowfall, we experienced great skiing conditions, a fun laid-back ski-town atmosphere and a staff that was incredibly knowledgeable and helpful. If you're looking to take a ski trip in Michigan or the Midwest for that matter, we highly recommend making it Shanty Creek, they did not disappoint! Stayed at the Lakeview Hotel.The sidewalk up to the front door was not shoveled. Had to carry my bag and really stressed my back. Our room was very noisy. Could hear every footstep from the room above us. The mattress was very soft and saggy. Coffee pot was dirty. The Gym Equipment was outdated with some of the benches had duct tape to hold the cover on. I got the feeling it was just not clean and cut my workout short. I wanted to use the hot tub and pool but just got too grossed out. Very disappointing! Went to the Lakeview restaurant located in the hotel. The table I got seated at was dirty. The staff did not come to my table once with out me asking a passing bus person. The table next to me had the same problem. All the waitstaff were gathered around the hostess talking. For 200.00 plus a night this was totally unacceptable! If I were paying $50 it would have been what I paid for. This was my only vacation this winter.  I have just read this article on Shanty Creek Resorts and it is excellent with much needed information in a lot of area’s. I do wish, however, that some items from the pro-shop could be for sale on line. Often, it is an afterthought and you regret not buying while there. Or, perhaps want to surprise the kiddo’s with Schuss sweatshirts to say “We are going to Schuss!” In my immediate case, we returned home on this past Sunday and I realize I need a granddaughter birthday gift for this weekend. Gee, I wonder if I can buy her a Schuss t-shirt or sweatshirt without making a 4-hr drive?